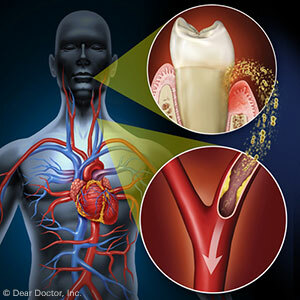 What's the biggest cause of tooth loss? You may think it's decay or oral trauma, however, research from the National Institute of Dental and Craniofacial Research shows that gum disease actually damages more teeth than any other dental health issue. At Lawrenceville Dental Implant Center and Periodontics, Dr. John Lu and Dr. Raul Figueroa use the latest techniques to manage periodontal disease. Education is key, so read here about the signs of gum disease and how to combat them. All of these conditions and more develop or worsen as bacteria-laden plaque and hard tartar build-up between teeth and underneath the gums. In its mildest stages, gum disease responds well to in-office hygienic cleanings and improved brushing and flossing at home. A diet rich in fruits and vegetables helps, too, as does smoking cessation. If, gum disease advances, however, Dr. Lu and Dr. Figueroa may recommend interventions such as the deep cleaning of tooth surfaces and root planing below the gum line to remove deposits of plaque and tartar. The installation of antibiotics also quells infection so that gums can heal and reattach to tooth surfaces. For advanced periodontal disease, your periodontist uses gum and bone grafting, flap surgery, and other advanced surgical techniques to stabilize teeth, restore bone and gum tissue, and to promote long-term periodontal health. Performed right at Lawrenceville Dental Implant Center & Periodontics, these state-of-the-art procedures correct a wide variety of harmful gum issues. Are your gums healthy? Periodontal, or gum, disease affects nearly half of American adults, according to the Centers for Disease Control and Prevention, yet many people aren't even aware they have the disease. Our Lawrenceville, NJ, periodontists, Dr. John Lu and Dr. Raul Figueroa of Lawrenceville Dental Implant Center and Periodontics, can discuss symptoms of the disease with you and explain treatment options. How can I tell if I have periodontal disease? Bleeding Gums: Healthy gums don't bleed when you floss or brush your teeth. 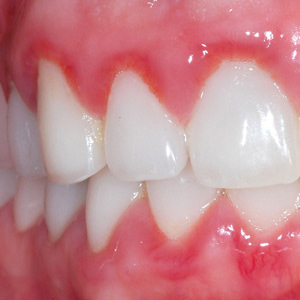 Bleeding gums are a sign that you may have gingivitis, the mildest form of gum disease. If you taste blood in your mouth when you brush or notice that your toothbrush is pink or red after brushing, call our Lawrenceville office to schedule an appointment. Gum Swelling: Periodontal disease develops when tartar on teeth irritates your gums, causing redness and swelling. A good oral hygiene routine can eliminate plaque before it can turn into hard tartar. Bad Breath: Bad breath may become a constant occurrence if you have gum disease, despite frequent brushing and flossing. 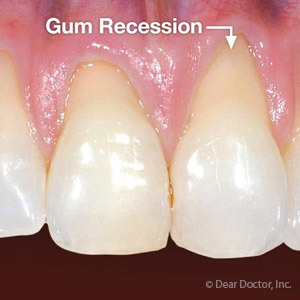 Receding Gums: Receding gums make your teeth look longer and expose the roots. Without a protective covering of gum tissue over your teeth, you may experience pain when you eat or drink hot or cold foods and beverages. Pockets: As the disease worsens, the gums will pull away from the teeth, creating deep spaces called pockets. Bacterial infections in the pockets can destroy gum tissue, ligaments and bones that hold your teeth firmly in place. Loose Teeth or Dentures: Loose teeth can occur during the most severe phase of periodontal disease. The disease may also change the fit of your dentures. Gingivitis symptoms can often be reversed with planing and scaling. During this deep cleaning procedure, plaque, tartar and bacteria are removed above and below the gum line. If the disease is severe, you may need surgery to reduce the depth of your pockets and gum grafts to replace damaged tissue. Prompt treatment from a periodontist, a dentist who specializes in gum disease, can help you avoid tooth loss due to gum disease. If you have any of the symptoms of periodontal disease, call our Lawrenceville, NJ, periodontists, Dr. Lu and Dr. Figueroa of Lawrenceville Dental Implant Center and Periodontics, at (609) 896-0700 to schedule an appointment.